We have been so busy at Studio E with filming, photo shoots, children’s parties, consultations and let’s not forget cakes!! We have had a great time with Nikki Kirk shooting some of our fabulous cakes and favours. We will be using them to update our web site soon. 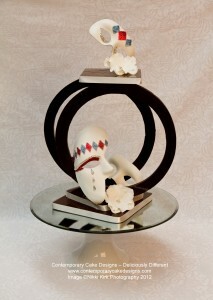 Check out this stunning chocolate show piece. Yes it’s all chocolate!!! !